Pierre Bourdieu, described by The Nation as “worthy of the militant mantle of Sartre and Foucault,” here continues the themes advanced so successfully in his previous book Acts of Resistance. Firing Back is an eloquent dissection of globalization’s intellectual and cultural role throughout the world, and a discussion of the ways in which effective opposition to it can be mounted. Bourdieu examines Europe’s potential as a counterweight to America’s globalizing policy and discusses how intellectuals and those working in the cultural sphere can create meaningful alternatives. He also raises challenging questions about the depoliticization of the academic world, arguing that scholars can no longer maintain that their research is objective or value free. 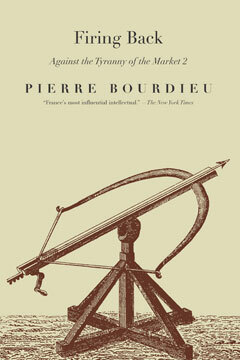 In a preface written for this edition, Bourdieu directly addresses American readers about the role they can play in the burgeoning antiglobalization movement.